Can you please post Josepha's picture ? Look at the post of Mari (reply nr 13) There is a link for Josepha's picture! Isn´t it strange that beautiful Josepha became a companion to Georg of Bavaria in 1897 and their only child was born in 1919 (same year when Georg started to study theology)? If 22 years after starting their relationship they had a son, it means they were still in love. George was divorced from Isabella and Josepha was I think single. Why not a morganatic marriage to Josepha in 1919 instead of becoming priest? This is where We need a DNA test.....or private Correspondence Josepha would have held in which the recognition would have been there! Has this been posted Prince Georg taken about 1912-13? click on name through wife Isabella I have tried to link it through other ways! Georg did not have a son. I have just found that Georg would have had a son with a certain...Josepha Zapletal, Frantisek! (1880-1999).What about??? Why not: well because there was no Josepha. THE STORY IS FALSE! Totallly made up! The story is totally false - and that becomes evident when reading the story and finding inconsistencies and improbabilities. Georg never had a son .. In 1980's I did research at the Bayerisches Hauptstaatsarchiv in Munich. Also, I had a limited permission to conduct some work at the Geheimes Hausarchiv and the Kriegsarchiv. During that time, I was privy to see a copy of court cases, which took place in Czechoslovakia and later continued in (I believe) Breslau, Silesia, regarding the legitimacy and name rights of Prince Georg's son. Among the many papers was a typed letter from the Prince confirming that he is a father of this child - e.g. Declaration of Paternity. I do not remember exactly the wording of it, but it was very short letter from either 1919 or 1920. What I found interesting was that the Prince was at that time living in Austria under the alias Georg Wartenberg. Of course, that may have been the result of the fact that aristocracy and the aristocratic titles were outlawed in the Austrian Republic following WWI. In conclusion, what Marlene said in her posts is wrong. I don't know what she is basing her opinions on, but it is not the facts. I saw the evidence with my own eyes and the proof indeed exists. Interesting information Erik. There are a lot of people claming to be descendants of Royalty and sometimes there is a tendency to not believe. But if research is done and facts are proven then one can see that it is also true that many Royals had indeed illegitimate descendants. I received this photo last week via a friend in the Netherlands. Apparently, she found it somewhere on the web. I thought you guys may like to see it. 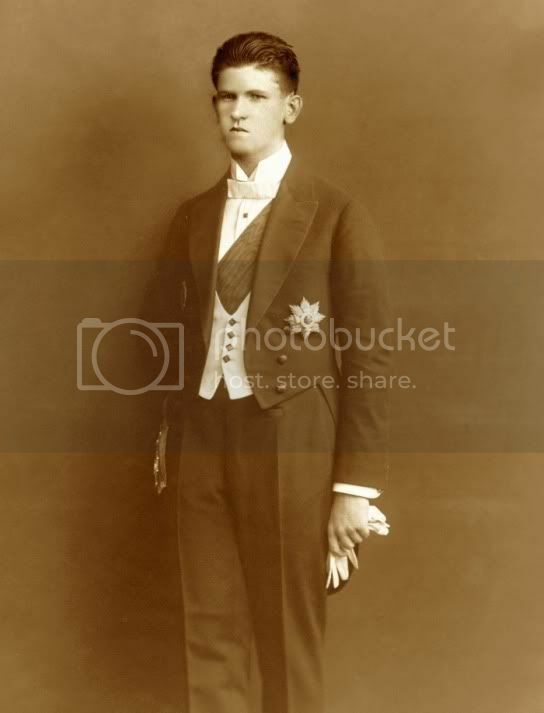 It shows the son of Prince Georg of Bavaria, Franz in 1937. The photo was taken by photo-studio Obergassner, Munich. I am curious what is the star-shaped decoration and sash he is wearing? great picture thanksd! but first of all, are we 100% sure that the story of this son its true?. Im confused.